They waited years for this moment. And in the new season of The Little Couple, Dr. Jennifer Arnold and Bill Klein finally get a glimpse of their first child. 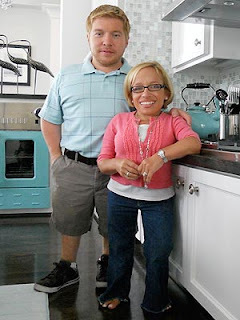 In this sneak peek from TLC, the couple meet with an adoption expert, who soon shows them photos of the child they will eventually go on to adopt – a 3-year-old boy named Ben from China who, like them, has a form of dwarfism. "Oh, he's so cute!" Arnold says as she sees the photos for the first time. "He's a happy guy. He looks so happy." Arnold adds: "The moment I saw him, I knew that I wanted Ben. I could just envision myself taking him home and having him running around the living room and him being part of our family." Two years ago, they were able to transfer an embryo to a surrogate, but the surrogate later miscarried. Along with their recent foray into adoption, Arnold and Klein say they are continuing to explore surrogacy as a way to expand their family. The new season of the show premieres April 30 (10 p.m. ET) on TLC.